Members of IU’s delegation awoke Friday morning to the finest weather we’ve had all week here in Beijing, including warm sunshine, clear skies and a delicate cool breeze that made it feel like we were back home in Indiana enjoying the first day of fall. Indeed, it would’ve been easy to take an end-of-week breather and indulge in Mother Nature’s pleasant offerings, especially following a busy Thursday that saw the signing of a new university agreement at the Chinese Academy of Social Sciences, meetings with senior leaders in China’s education and finance sectors, and the celebration of a major art exhibition marking the start of a landmark cultural collaboration between IU and Tsinghua University. Gymnasium at Renmin University in Beijing. But there was a bit more business to get to – including building the beginnings of one more promising global partnership – before the start of tomorrow’s highly anticipated IU is Global 2018 Alumni Conference and Reunion, which is expected to draw hundreds of IU graduates from China and around the region to Beijing for a day of scholarly presentations, speeches from distinguished guests and special celebratory activities. 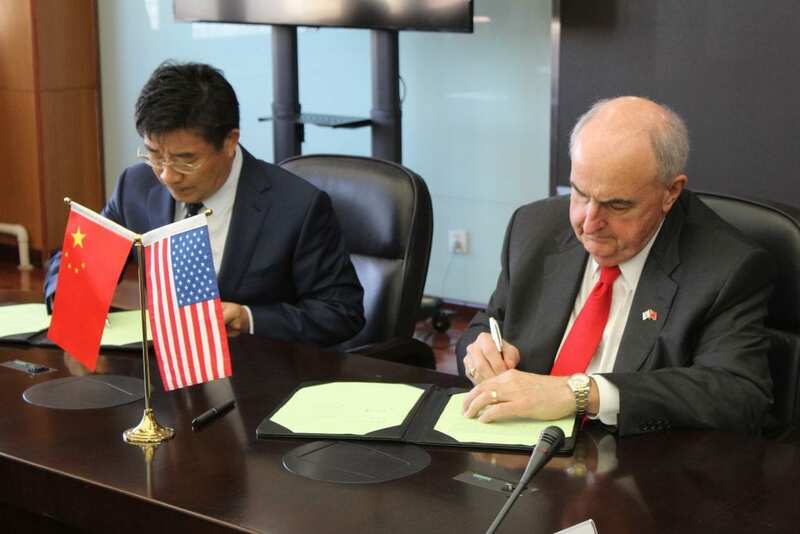 On Friday morning, IU President Michael A. McRobbie and Vice President for International Affairs Hannah Buxbaum led their colleagues to Renmin University, or RUC, one of East Asia’s most elite research universities, located in the northwestern part of Beijing. Established more than 80 years ago, in 1937, RUC has earned the reputation as one of China’s premier universities for teaching and research in the humanities and social sciences, and it now has around 24,000 students on its main campus, which is just a short drive away from several other top schools in China – and longtime IU partners – Peking University and Tsinghua University. 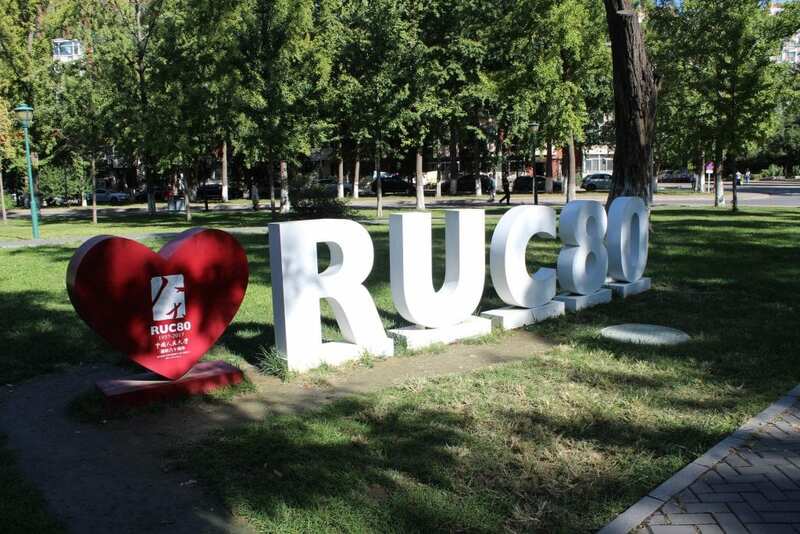 Renmin University, or RUC, recently celebrated its 80th anniversary. Since we arrived a few minutes early (not only did the Beijing weather cooperate today, but so did the traffic), we had the opportunity to take a quick tour of RUC’s pretty, tree-lined campus grounds, including its impressive gymnasium, where about a dozen students were engaged in heated games of badminton, and several outdoor ping-pong and basketball courts, also brimming with students. A quick aside: Watching several other RUC students shoot hoops underscored just how popular basketball, which now more than ever is a truly global sport, has become in China. It also served as a welcome reminder that IU was the first institution in the U.S. to broadcast – beginning in 2015 and led by a team of student announcers – its basketball games in Mandarin. 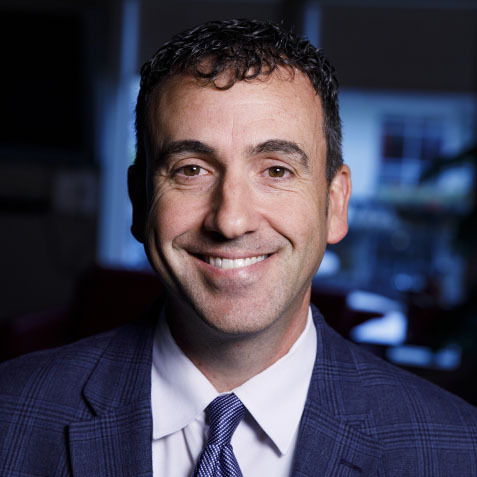 This has ensured that IU’s more than 3,100 Chinese students and over 7,000 China-affiliated alumni around the world stay connected with the university and one of America’s most storied collegiate sports programs. When it was finally time to meet, President McRobbie and RUC President Wei Liu took turns sharing the strengths of their respective universities, which, not surprisingly, seem uniquely well matched, particularly given IU’s decades-long tradition of excellence in the arts and humanities. During the meeting, McRobbie highlighted, as he has done so many times this week, the large number of IU students (around 500) studying Mandarin Chinese at all levels and instruction. 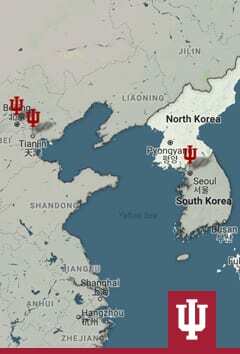 He also discussed the substantial increase in the number of IU students choosing to do a period of overseas study in China. Continuing an upward trend, China currently ranks in the top 10 countries where IU students choose to study abroad, and it’s now the No. 1 study-abroad destination for students from the IUPUI campus. For his part, President Liu talked proudly of RUC’s 14 “world-class” disciplines and the university’s No. 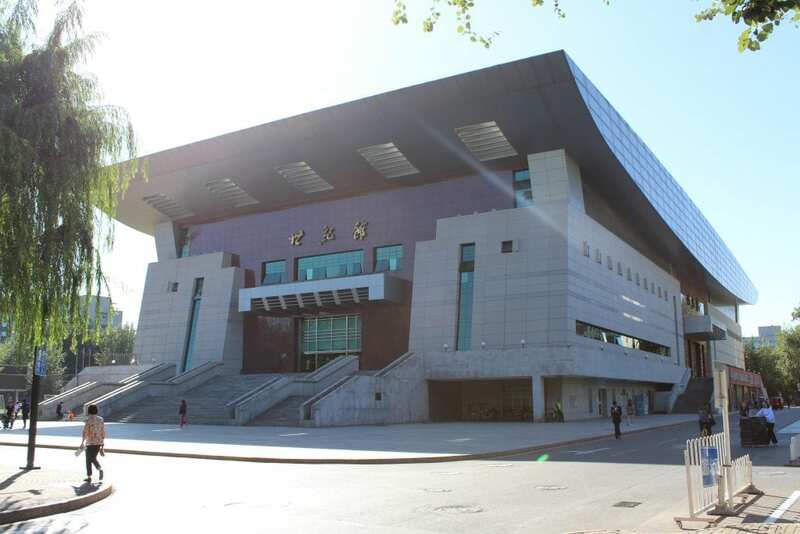 1 ranking across nine fields, including law, political science, journalism, sociology, theoretical economics, applied economics, business administration, public administration and statistics. IU President Michael McRobbie, right, and Wei Liu, president of Renmin University, sign a new partnership agreement between their respective institutions. Both leaders described a shared goal of increasing the number of student exchanges between IU and China, building on past collaborations (IU’s McKinney School of Law has had a successful summer program at Renmin for many years and recently increased the scope of the relationship to include faculty exchanges) and engaging in other opportunities to work together across areas such as law, public administration, public policy and sociology. Interestingly, Renmin is also home to a sizeable contingent of scholars interested in the work of the late IU Distinguished Professor and first woman to win the Nobel Prize in Economics, Elinor “Lin” Ostrom, several of whom we met the last time we were in Beijing at a special symposium on Ostrom’s remarkable career at IU’s China Gateway office. Michael McGuire, executive dean of IU’s top-rated School of Public and Environmental Affairs, and John Yasuda, assistant professor in the Department of East Asian Languages and Cultures at IU’s School of Global and International Studies, who also joined members of the IU delegation at the Chinese Academy of Social Sciences, planned to follow up with their RUC colleagues and these and other possible collaborative activities. Before parting ways, McRobbie and Liu signed the first-ever agreement of friendship and cooperation between their respective institutions. The signing signaled a major step forward for the burgeoning IU-Remnin relationship, while also once again reflecting IU’s major presence – and continued efforts to strengthen its engagement – here in East Asia. After the agreement-signing at RUC, McRobbie, Buxbaum, former U.S. ambassador and founding dean of the IU School of Global and International Studies Lee Feinstein and several other members of the IU delegation were invited to a working lunch with former IU faculty member Yi Gang, governor of the People’s Bank of China. The People’s Bank of China is China’s central bank, responsible for carrying out the monetary policy and regulation of financial institutions for the world’s second-largest economy. Yi, who served as assistant professor and associate professor of economics at IUPUI from 1986 to 1994 and received an honorary doctorate from IU in 2012, was named governor of the People’s Bank earlier this year. 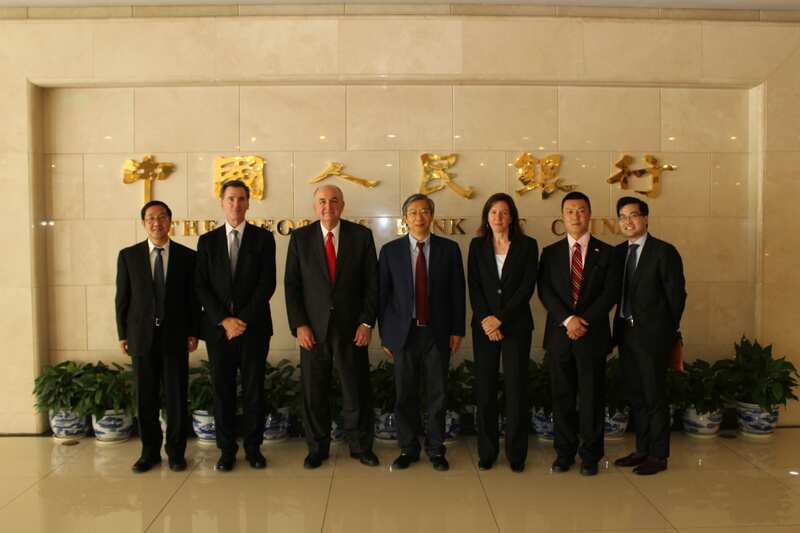 The meeting was held at the People’s Bank headquarters, located in downtown Beijing, where Yi, McRobbie and their respective colleagues discussed a number of issues concerning global economic and cultural affairs and the continued internationalization of higher education in the U.S. and China. Members of the IU delegation with Yi Gang, center. A former IU faculty member, Gang is the governor of the People’s Bank of China, the country’s central bank. 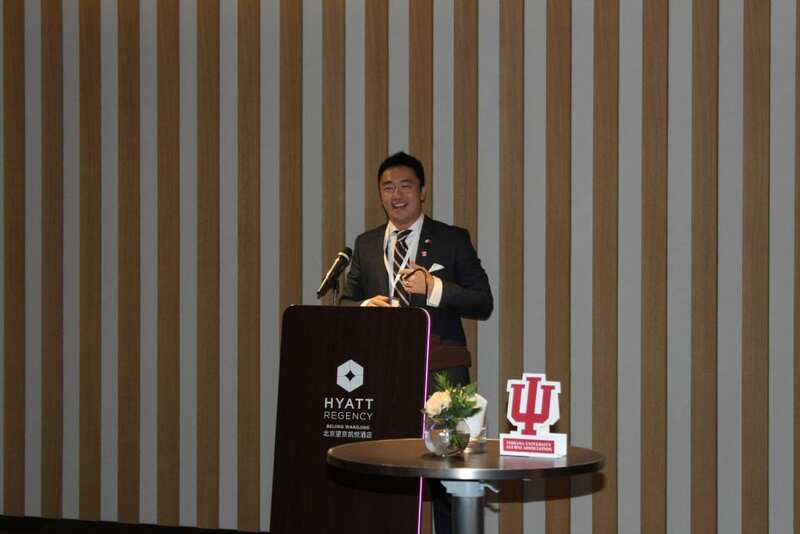 The final activity of Friday was an evening reception, which brought together the leaders of the Beijing Chapter of the IU Alumni Association, distinguished IU international alumni and the IU delegation, to kick off the IU is Global 2018 Alumni Conference and Reunion. The all-day event, which is being sponsored by the IU Office of the Bicentennial, officially starts Saturday morning and will feature remarks from McRobbie and Buxbaum, a keynote address delivered by IU alumnus and producer of the “Batman” movies Michael Uslan and multidisciplinary panels on a number of important issues affecting East Asia and other parts of the world moderated by IU faculty and staff. It will be the fourth major international conference and reunion for IU’s Asian alumni. The first was held in Chiang Mai, Thailand, in 1999. Vince Wen, chair of the IU is Global 2018 Alumni Conference and Reunion Committee. All of us look forward to seeing our alumni again at tomorrow’s conference sessions!